The one downside of Weekly Shonen Jump Online is that not everyone wants to play along. Tumblr has become a cesspool of spoilers for me. Even deviant art is dangerous ground to tread. But where in the past I didn’t care, because I was reading scanlations when they came out, now I find myself caring very much. Has anyone else been having trouble with spoilers, now that you’ve been waiting for the chapters to be officially released? Also, would anyone like me to give each chapter a grade? I know people like grades when reading reviews, so I’ve been wondering if that’s something I should adopt for this column, or if it wouldn’t work well. Leave your answers in the comments if you please. 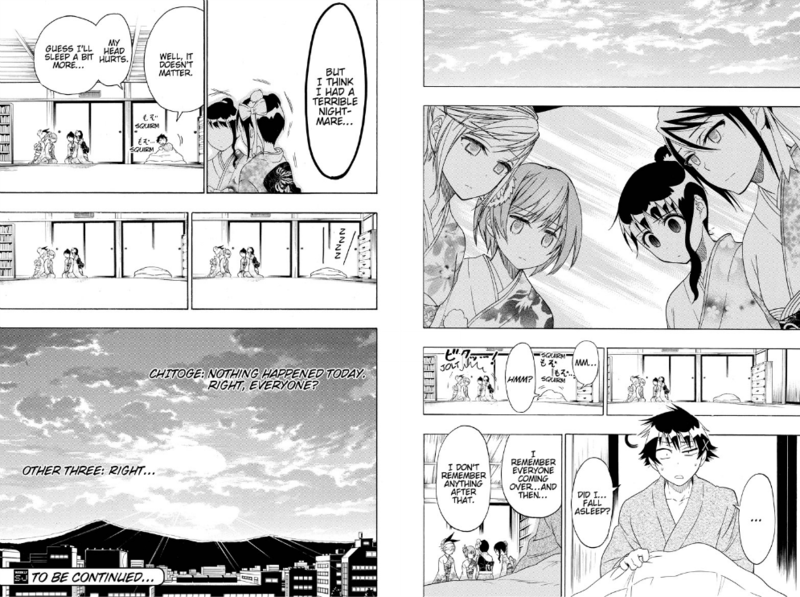 All I have to say about this week’s chapter is, what did they do to Raku!? Someone please tell me, otherwise it’s going to be left up to my imagination, and my imagination is a dark, scary place! Either way, this was a great chapter. As I’ve said, I love me some comedy, so the more comedic Nisekoi gets the happier I get. And a chapter focusing on all the girls in the series getting drunk off liquor candies? All the better. Reviewing comedy is a bit tricky, because my gut instinct is to tell you all about the jokes, but I can’t possibly do them any justice, so please, if you haven’t yet, go read this chapter. Once again, every week I think to myself, “I should really give the number one spot this week to a different series. I ALWAYS give it to One Piece, people are going to start thinking I have inflexible taste.” And every week I read the chapter, and my first reaction is, “Well sonnuva…” I really, really don’t want anyone thinking I rate One Piece as high as I do just because it’s my favorite series, not because of the merits of the individual chapter. But when the individual chapters are just so good, what else can I do? This week’s chapter is so good partly because we get our first look at Dressrosa, and partly because we get introduced to a character who was most likely first mentioned last week. 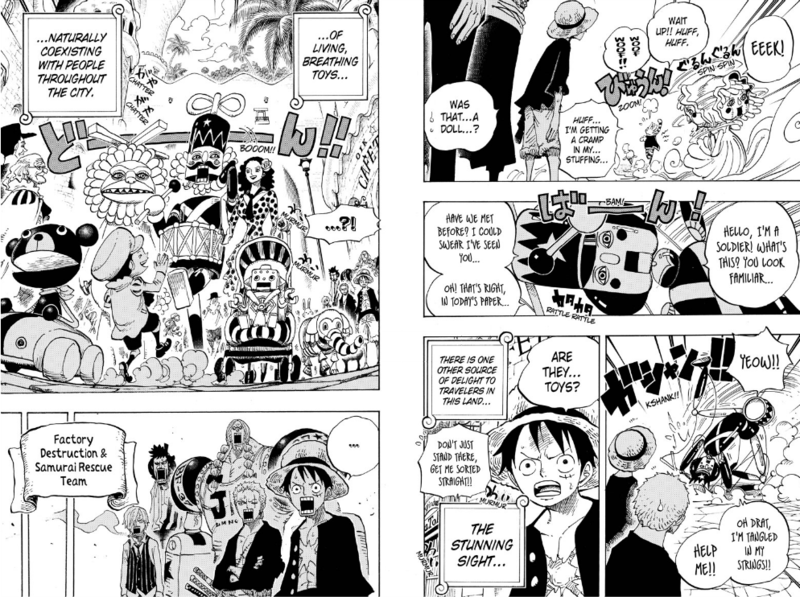 Creative world building, well written comedy, and great action—this week has all of that, as One Piece usually does. If you aren’t reading this series yet, then you need to take the plunge and invest the necessary time to get caught up. It really is that good. I’ll say this about this week’s Naruto, it was better than last week. There was much less misplaced comedy and the confrontation begun at the end of this chapter looks like it will be a lot of fun, and was well set up. I’m finding myself enjoying this flashback a bit more, now that I’m a few weeks removed from remembering that it is awkwardly placed in the story as a whole. And I have to admit that I’ve been interested in this time period in Naruto history. So for now I’m looking forward to more. The big problem with Dragon Ball Z, for this column at least, is that because of how action-intense it is there will be weeks where I find myself with nothing to say but, “Well, there was punching.” Though I suppose that might be more than could be said for some episodes of the anime. In this case I find that the action was of course well executed and, unlike the anime which more people are familiar with, the fights actually move at a good pace. Rather than ending the chapter at a stalemate, Goku and Picolo are both injured, with only one chance to take down Raditz. In my own opinion this version of the story is the superior version, and any fan of Dragon Ball Z who hasn’t read the manga yet should be using this chance to become familiar with where it all started. It’s strange how Cross Manage has been embedding itself in my heart. I can’t think of any clear, specific reason for why I like it so much, but with every new chapter I find myself thinking that I would hate to see it go. Perhaps it’s the absurd humor, it might even be the surprisingly frequent fanservice, but whatever it is, it’s an entertaining read even if it has little to do with the titular sport. Really it’s all about the character humor. In this case, Namine Chihara, is such an odd duck that I can’t figure out what her personality is meant to be. Either way, it’s entertaining. Currently she’s the closest thing to an antagonist we have, but she doesn’t seem like she is actually evil. Which of course works much better for the real world setting Cross Manage is going for, where antagonism is generally less about all out evil and more about people with opposing goals coming into contact with each other. I really liked this chapter, and hope that we get many more in the future. World Trigger, for its strong start, has been a bit lackluster these last four chapters. This week, however, we did get some answers about how the triggers work. But rather than have a character explain it, we pick up nuggets of information from Yuma behaving the way a proper character is supposed to. He doesn’t explain anything, but his dialogue still reveals important information. I can appreciate this level of writing, after reading many, many series where any and all exposition is imparted to the reader through clunky dialogue. I’m still wary about whether this series will go anywhere, but there is some real skill behind this writing. So we shall see. One-Punch Man is the story of a world where everyone is trying to have regular superhero fights, but one man refuses to play by the rules. I had this revelation after seeing Saitama interact with more than just the villain of the week. And with the story eight chapters in, I think it’s safe to say that the one punch joke somehow just isn’t getting stale. I’ll let you find out for yourself why exactly, but the last page of this chapter was the funniest thing I read this entire issue. Ah, sweet, sweet answers. It’s been a while since I’ve been invested in Bleach. And while I refuse to ever get involved in the fandom again—once burned twice shy after all—I am slowly getting interested in the series again. After all, we’re finally getting Isshin’s story, something fans have been wanting forever. And so far it isn’t terribly written, so I think I can get properly invested. This chapter was nothing but answers. For one, we finally find out why Ichigo and Kaien were practically identical, and unlike the reveal of Ichigo’s mother, while there was a theory that Ichigo and Kaien were related, the reveal was handled properly this chapter, in that it didn’t act like the reveal was bigger than it was. So, kudos to Kubo. Ah, nothing like powerups out of nowhere. It takes a certain kind of clout to properly pull that off. And where before only One Piece was able to do that without annoying me, Toriko seems to be aiming for similar heights, because Sunny’s powerup may be out of nowhere, but it’s far too cool for me to care. 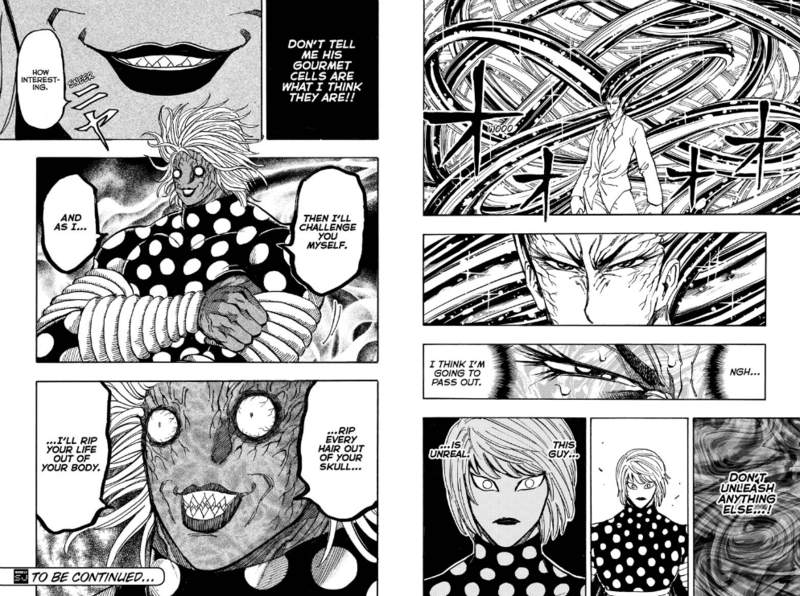 The majority of this chapter really was just Sunny and Tommyrod’s fight, but that was more than enough for me. I’m not sure exactly how using sensor attached to hair is meant to be culinarily themed, but I think I’ll give it a pass, just because it is unique from all the other methods of fighting this series provides. And the only way to keep multiple fights interesting is by having varied fighting styles. And Toriko never disappoints in that aspect. 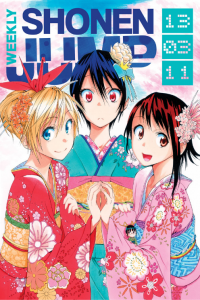 If you want to hear more, check out the Manga^3 Podcast Archives. 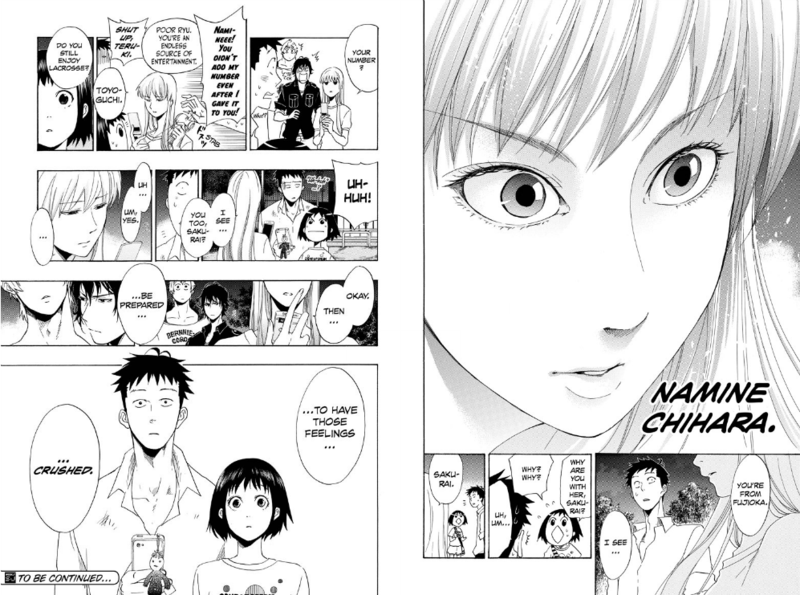 Or go directly to last week’s episode, Episode 038 – March 4, 2013 – What is Josei Manga? | Nanatsu no Taizai. Derek Bown is a creative writing and editing student at Brigham Young University. He started watching anime back when Pokemon was first popular, moved on to Ranma 1/2 and One Piece, and eventually found his way to manga. He runs his own anime and manga review blog at Burning Lizard Studios, which he started back in 2009. He is a massive fantasy fan, and loves comedy and action manga the most. His knowledge of anything other than shounen manga is woefully inadequate, but he knows his way around pretty much any action fighter series worth reading. He also happens to be a closet romantic, but will deny any knowledge of shipping fandom if asked. His favorite manga are One Piece, One Piece, and One Piece. Cool! When the reviews are detailed like this I don’t really need a grade, but I’m sure other people will disagree. Anyway, I wouldn’t be able to read just one chapter at a time. It’s so little! I tend to go for finished series when I can, or at least complete volumes or sagas. Yeah, giving it grades also has the downside of giving people an excuse not to read the review itself. Though, as a reader I find I like to check out the grade first, get a basic idea of what the chapter is about, and THEN maybe go back and read the review. I love to read large chunks at once, but if I were to wait for series like one piece to end I’d not read it till I was ninety. I don’t tend to browse tags on tumblr, so I don’t get spoiled, but it is annoying that if I want discussion about the chapter, it’s happening before I’ve read it. I got so distracted by those questions I forgot to actually comment on the manga, which I had been planning to do! I am really, really happy to finally get this backstory on Isshin. I was hoping for it in the last arc and it never materialised, so then when we were getting all these “you need to know who you are” hints I was afraid it wouldn’t really pan out. I really loved Turn Back the Pendulum and hope this will be another nice, long flashback arc. This is one of those rare cases where I like the flashback, because I’ve been waiting for it for years. Turn back the pendulum I was a bit ambivalent about, but in this case I feel it is better placed in the arc as a whole. Hopefully Kubo can keep up the good work long enough to keep this momentum going till the end of the manga. I’ve run into spoilers thanks to someone I was following on tumblr. Unfortunately for them I’d had it up to here by that point thanks to running into spoilers elsewhere, so I unfollowed them. Change back Bleach to the way it was, end the 3D2Y time skip code, stop making fans of Bleach angry, and stop ruining my life!! !